If you're reading this, you're either a Valentine's Day fanatic or you've forgotten to give your best Neofriend a gift! My name is Ryder and I'm back again in The Neopian Times to help you out on this very special occasion. Valentine's Day is the perfect day to demonstrate to a special Neofriend in your life how much they mean to you and how much you appreciate them. Whether it be someone who's always there to give you advice or someone who always has your back, Valentine's Day is the perfect opportunity to say "Thank You" to them for everything they do for you. With that said, I've compiled a list of the most desirable gifts for that special someone who means so much to you; and all for an affordable price - around 5,000 Neopoints! Now, there are a couple exceptions… but we'll sort that out later. These items are curated for their beauty, impact, and implied message. Every year, on the 14th day of Awakening, it is Valentine’s Day! Symbolized by pink hearts and Cupid Neggs, Valentine’s Day is often accompanied with exchanging gifts and spending time with your loved ones. That thought can inspire either happiness or dread in all Neopians. 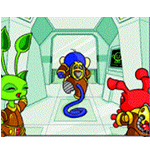 After all, there is a lot of pressure to show your beloved Neopets how much you care about them. "I'm so excited to start gardening!" Lola gushed to her friends. The yellow Cybunny closed her locker and clapped excitedly. "The garden will mainly grow flowers, tomatoes and carrots for now. But in the future, I'd like to expand it to add more vegetables." Scary sighed. "And you're telling us this…WHY?" demanded the purple Bruce. "I was wondering if I could invite some of my friends to come along and assist me with the gardening," Lola explained. "With a few extra hands, I'm sure I can get all the digging and planting done in one day." Sparkles nodded. "I would love to help with the flower planting," said the pink Bruce, as the three girls exited Neoschool. "Splendid!" cheered Lola. Scary rolled her eyes. "Bo-ring," she drawled. "I was also thinking that we could have a backyard picnic after the planting is all done," Lola continued. She hopped excitedly. "This is going to be such a fun Saturday!" "You honestly want me to waste my precious Saturday gardening?" scoffed Scary. "Do you have any idea how dirty my clothes would get?" "It sounds like a gardening party," said Sparkles happily, "and we'll be certain to be at your house nice and early! Then we'll get the gardening started." "I repeat what I said before: bo-ring!" Scary groaned. "You two are the best!" Lola gave her friends a hug and a beaming smile. "I'm certain my garden will flourish wonderfully as long as I have two of my closest friends by my side! And we'll have lots of fun, too!" Maximillien brushed the back of his head and followed behind the Shoyru, who had used her mapping device to be able to map the rest of the tomb. They eventually came to the Tomb of Pharaohs which had the sarcophagus in the middle of the room. There was the sign of something which had slid across the floor and a few pieces of bandages, but Eyrieki was nowhere to be seen. Maximillien walked over to the open sarcophagus and reached inside, pulling out a parchment which seemed to reveal the locations of the various tablet pieces they had been searching for. "Take a look at this. ", The Werelupe's tail wagged, "I think I've found something." "Let me see...", Pepper took the parchments and examined them, "It seems that the doors on the parchment correlate to the number. If we can identify which room holds a tablet piece, we should be able to not only find the pieces we need...we can even do it in order!" "Can you program that? ", The Werelupe tilted his head quizzically. "I certainly can! ", The Shoyru beamed, "Let me fine tune the coordinates..." Beep, the machine made a noise when the correct coordinates had been input inside of them "Ahhh, there we go! It should work now." The pair managed to scout the many different locations and narrowly evade the traps all while walking through the tomb. They had collected all of the separate pieces of the tablet before long, and made their way back to the exit of the temple. Guaranteed to be a jawbreaker!